A few short years ago, Peter Hubin was submitting stories to The Country Today newspaper and writing for the History of Washburn County and the Washburn County Historical Society. It wasn’t until the suggestion came from his wife, Betty, to write a book that he began writing novels. Several years and nearly six published titles later, Hubin is a successful, sincere author who writes purely for the readers’ enjoyment, describing his writing style as “folksy and unpretentious,” adding, “I basically tell it like it is, but don’t write to upset anyone. I want the reader to feel like I am ‘visiting with them.’” This style he describes is unquestionably sensed by the reader, providing a relaxing atmosphere that allows readers to be truly comfortable with the characters and easily relate to the story. Hubin relates to this idea himself saying, “The brook is constantly flowing, which may symbolize my life as a living person. As the stream gets larger it helps me to understand how I have learned many new and important things. 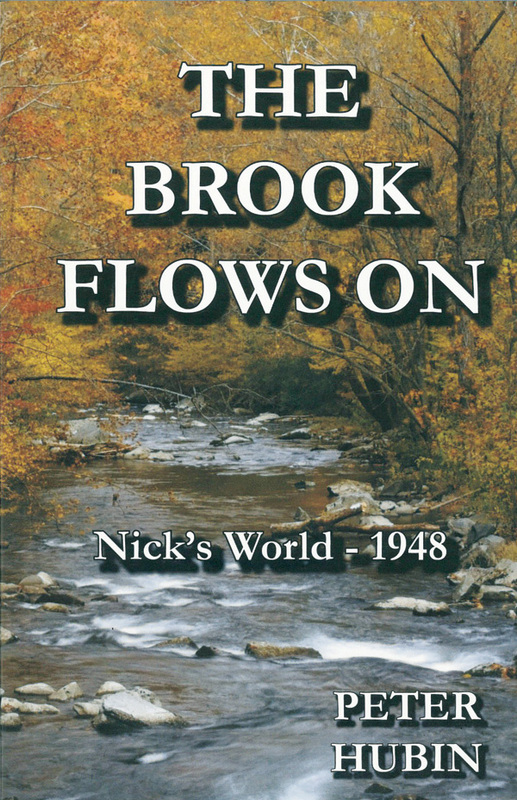 Beaver Brook will end when it flows into the Yellow River, just as my life will end someday,” a notion that played out in the book’s title, The Brook Flows On. Other important characters are Nick’s parents, who play a strong role in supporting him emotionally, and Earl, an injured veteran Nick will welcome into his camp and befriend. Hubin has always been an avid reader and took inspiration for his writing from several aspects of his life, such as his “kind, helpful, caring” parents – whom he hoped to be just like – and the beauty of the forests, lakes, rivers, rolling topography, open fields, and charming country roads of northern Wisconsin that are pleasing for the soul. He is a Wisconsin native and has lived here all but one year of his life, spending most of his time in Spooner. Although Hubin has had no formal training in writing, he has been stimulated by his environment. In 1948, Hubin was 10 years old and remembers very much how things were then: the relief of World War II ending, the communal attitude, learning to trout fish at Beaver Brook, and his fascination with running water. “Authors are advised to ‘write about things you understand,’ ” he says. “Of the six books I have written, four deal with our beautiful forests. The other two books are about my life and a large influence was from my contact with the forests. The animals and fish that live in the forest or waters within have always attracted me. While I admire man’s work to build buildings, roads, schools, etc., the sight of a forest is very comforting to me.” This theme plays out in some of his other publications, such as The General’s Den, in which the search for some runaway cattle in a forest leads to the discovery of a door, which is opened to reveal a room and a body of a dead man. Documents reveal him to be a Civil War general from Pennsylvania who had been dead for at least 135 years. Another publication, Barefoot Boy and Other Drivel, includes 60 short stories about Hubin growing up in the 1940s in the Spooner-Shell Lake area. You can find The Brook Flows On and other books by Peter Hubin at The Local Store, 205 N. Dewey St.; Crossroad Books; or by contacting him directly via Up North Storytellers.